Latest Update: Teasers of the Alpha without special effects or animations. Black Sands is a bold new visual novel drawing from African, Indian and Middle Eastern mythology, married to an innovative spin on speculation about ancient aliens and precursor races. This is largely unexplored territory for video games as a medium – and Black Sands aims to take it further than any other creative team has managed to date. 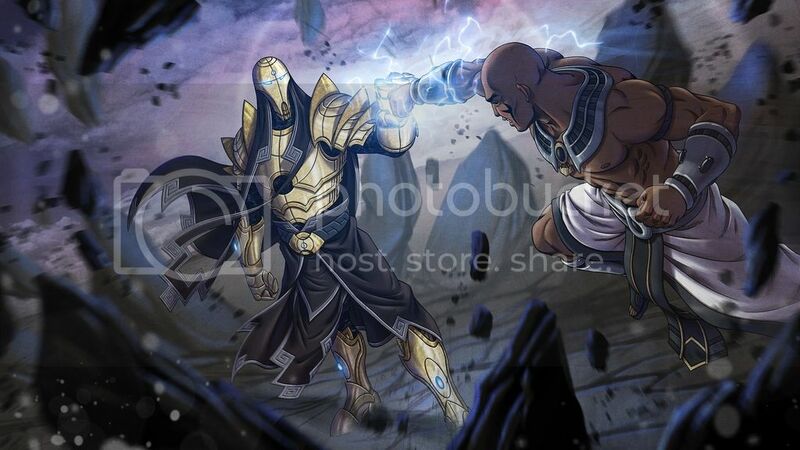 As Ra, the Dark Pharaoh, players must enter into a series of challenging trials posed by their creator, Nun – an emissary from the far-flung world of Nibiru who wants you, as his avatar, to wield godlike power over the ancient world. But before your legend can begin, you have to prove yourself worthy. In the Black Sands Universe, Nun engineered the beings humanity worship as gods – but his creations betrayed his grand plan, and plunged the Earth into an age of oppression. Rah and his companions are Nun's last-ditch attempt to fix his mistakes – but before he can unleash them on the Earth, he needs to know they're up to the challenge! You have to manage a team of mythical heroes; nurture their relationships, both with you and each other; explore the sprawling landscape of Nun's secret hideaway, the Rift; study its secrets and its tortured history, and defeat the countless enemies that stand in your way. Only then will Nun grant you your freedom! Black Sands is more than just comic-book heroics and wild conspiracy theories – it aims to convey a deeper understanding of real-world ancient history and cultural diversity as well. An in-game dictionary with scores of unlockable entries contains an explanation of the research that went into every character and location, giving their historical inspiration alongside their in-game backstories. Black Sands is also not simply a visual novel, too. Decisions stem from much more than simple emotional dilemmas or "choose your own adventure" branching paths. The story offers players the challenge of exploration, discovery, investigation and stat management over a rich, carefully crafted narrative and multiple side quests of many different types. Win your companions' respect to open up still more content as their backstories are revealed – or rule them by fear like the god you're destined to become. Scour the map for a huge number of secrets spread across a detailed, ever-changing world. Watch the clock! Manage the passing of time correctly, or the odds could end up against you and cause your death! Study the relics and artifacts to unlock achievements and lore – including the real-world research behind the fiction. Be entrenched in the development of a stunning production values from a carefully hand-picked team. A totally unique aesthetic – no other game has used this same material like Black Sands! The Book of Thoth is a lore database which allows players to learn the real history behind the ideas in Black Sands with sourced and quoted material. It will be split into three sections per entry. Fantasy - The way the person, place, thing is in the Black Sands Universe. History - The actual historical/mythological information about the person, place, or thing. Theory - The theory we use to make the historical figure into what we use in Black Sands. Examples would be like if you saw a vision through "The Eye of Oblivion" and saw giants in Canaan, you would unlock a new lore entry in game saying "Knowledge has been acquired." Then you would have two lore entries when you checked the Book of Thoth. One for the historical context of the Nephilim and one for Canaan. It should be a great experience for the knowledge seekers in the world. 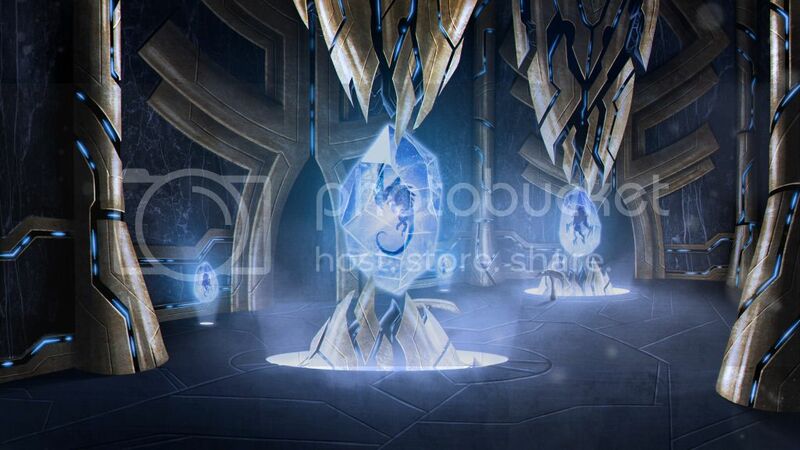 FANTASY In the bowels of a long lost Anunnaki burial chamber roams the Titan Coeus. He once was the most intelligent Titan to ever exist and was the most likely to succeed at developing humanity in the outside world. Fate was cruel to him though as his curiosity got the best of him. Nun warned all the ancient bloodlines of the three dominant spirits that were sent to Earth with him. Nun possessed one but the other two were lost in the crash landing of his ship. Coeus searched for years for relics of the long lost Sirius ship and did not heed the warning of Nun to notify him immediately if they ever were to be discovered. When he touched the relic, the spirit within it infused with his core, causing him to fall into madness. He tried to fight the urge for a time but eventually it took over and he killed an Anunnaki by draining it of its soul. Uranus, his father, intervened on his behalf when Marduk seeked vengeance. Marduk did not trust Uranus to honor his word though and negotiated the terms of his punishment. The Annunaki would build a cursed facility under the ground which would keep him imprisoned for eternity with special sigils that drained his power. He is forever roaming these halls waiting for the day he can be free to feed again. HISTORY Coeus is of the Greek pantheon, known as the Titan of rational intelligence. He fathered many children and was considered a positive Titan. In the Titanomachy (The war between Titans and Olympians,) he was overthrown and imprisoned for an eternity in Tartarus (Hell.) unlike the other Titans, he went mad in his imprisonment and broke free of his chains in an attempt to escape but failed in his attempt. THEORY We decided to change the timeline a bit and tie his historical madness into his inquisitive nature. We liked the tragedy of an intelligent and benevolent Titan falling from grace due to his lack of wisdom. By showing his fall, we make him more relatable and also incorporate cross pantheon relationships between the Anunnaki and the Titans. This allows us to create vivid lore that mixes the two worlds and enriches the story of a mad god who was once a benevolent saint. Full blown critiques plz. 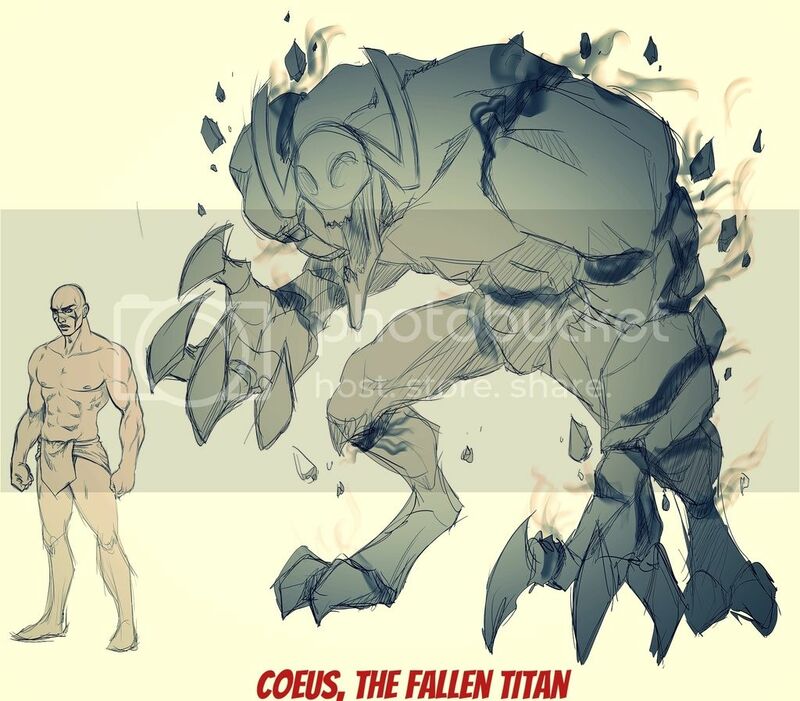 This is a rough of the Coeus concept which will be properly rendered at a later date. The image is the scale. Please critique and leave comments. We would love to hear from you.